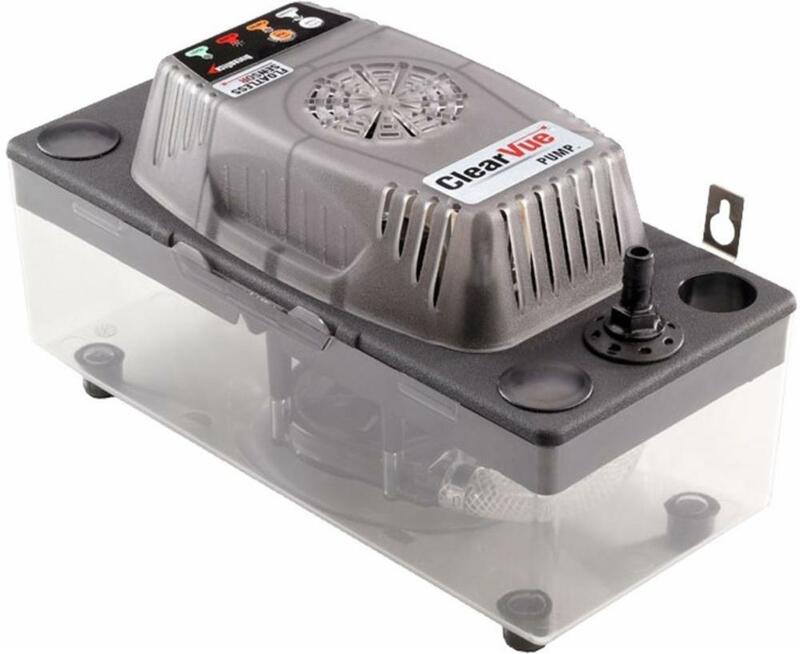 ClearVue™ Condensate Pump, Gray, 120 Volts/60 Hz;1.9 Amps Electrical Ratings, 22 ft Shutoff Head, +160 °F Temperature Rating, 1.6 gpm Flow Rate, 1/2 gal (Tank) Reservoir Capacity, 4.4 in (Inlet Height From Base) Inlet Size, 2 Year Warranty, Stainless Steel Mounting Tabs;Silicone Rubber Feet;Reversible Deck;Four Inlet Holes;Led Indicator Lights Includes, Stainless Steel (Mounting Tab);Silicon Rubber (Feet), 11.8 W x 5.9 H x 6.7 D in ClearVue’s iQ Technology™ and Floatless Sensor™ make this the most advanced condensate pump ever. This new pump can provide up to 22ft of lift if needed. ClearVue™ runs at the minimum speed needed, saving wear on the pump. The pump selects the lowest effective speed, making it quieter than a regular pump. Its unique self-cleaning feature senses problems and automatically enters a self-cleaning mode using condensate water to fix the issue. The ClearVue™ pump features a clear bottom tank to easily check the water level. Other features include:stainless steel mounting tabs, silicone rubber feet, reversible deck, four inlet holes, and LED indicator lights.